Friends, I am convinced that when we park and pray at 1:11 pm we engage in reverent submission. When we practice reverent submission we release our hands and our hold on our lives. We surrender our will and allow space for God’s will to manifest in our lives. When we say the Lord’s Prayer, “Thy will be done on earth as it is in heaven,” What is God’s will for us and for our situations? We often believe our will is not satisfied when God’s will, different from our will, prevails. Friends, trust God to hear your fervent prayers and petitions. Depend on God to do whatever is best in your life. Pray, asking in Christ’s name. 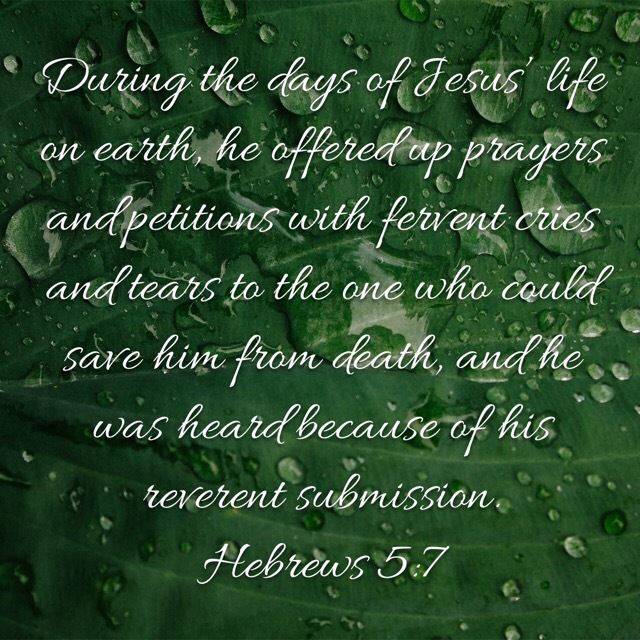 Just as Jesus’ prayers were heard you will be heard because of your reverent submission. Dear God, we long to do your will. Thank you for teaching us how to pray through lessons on Jesus’ prayer life. Help us to release our will, which holds us back from discerning your will. May the righteous desires of our hearts be fulfilled. In Christ name, we pray. Amen. Are you able to ask God to supply your needs? You’re invited to “Park and Pray at 1:11” pm in spirit with us. God is awesome and radically able to do more than we imagine.